FordPass. The app that heightens your experience. Find parking and fuel more easily with a SYNC®Connect-enabled vehicle! Control your Ford remotely and get from A to B better. You’ll soon be able to think of FordPass as your personal journey assistant. Whether you own a Ford car, or a vehicle made by another manufacturer, or you live in the city and don’t own a car, FordPass will help you find smarter ways to move. The way the world moves is changing. Join us and help shape the way you move tomorrow. This is just the beginning. More features are already in the works, such as Carsharing, booking your parking in advance, and paying through FordPass. FordPass Connect is slightly different - it's an integrated modem with a sim card that connects the car to the internet. Software updates happen over-the-air automatically, allowing you to access the very latest features such as a Wi-Fi hotspot for up to 10 devices. 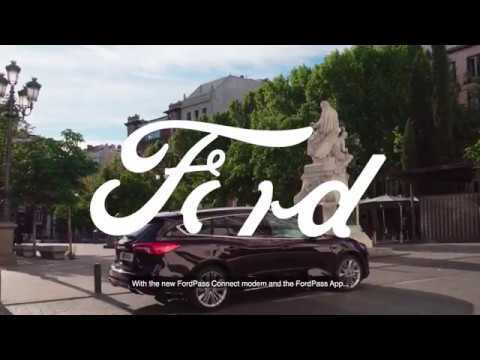 You can use FordPass and FordPass Connect together to get the most out of your experience, even allowing you to remotely start your car (on automatic Focus models). The Focus is the first car to benefit from this technology, but Ford will soon roll it out across more of the range. [*]FordPass Connect is an optional extra. The on-board modem will be connected at the time of vehicle delivery. You may choose to opt in/opt out of certain data sharing. The technology will be made available in selected markets in 2018, with the remaining markets following through 2019. [††]Live Traffic access is complimentary for the first 2 years following the purchase of a new Ford featuring SYNC 3 with navigation; thereafter a licence fee is payable. [‡‡]Wi-Fi Hotspot (up to 4G) includes complimentary wireless data trial that begins at time of activation and expires at the end of 3 months or when 3GB of data is used, whichever comes first. Afterwards a subscription to Vodafone is required, refer to their website for detail of their data packages. To take advantage of the built-in Wi-Fi hotspot capability, a 2018 Ford vehicle must come with the appropriate hardware, and a data plan is required. Data coverage and service is not available everywhere and terms of your data plan, including applicable message and data rates, may apply. [**]eCall is a European Commission initiative which mandates an in-vehicle system that calls emergency services if an automatic eCall event is activated by detection of a serious road accident, or if a manual eCall is triggered by a vehicle occupant. Available on new Ford Focus only.